Has any one considered making a bridal veil? I was talking to my mom about it and she suggested using sewing thread because you can get large cones of it, less likely to run out before I am finished. I have 2 teenage daughters so I am pretty sure I could get one done before either of them attempts marriage but have no idea where to start. I was thinking something pretty simple maybe just a large filet square or rectangle and then add a design around the edge. before you start, are you sure your daughters will wear it? Just a thought!! You could also crochet a headband similar to this one: http://www.etsy.com/listing/57077147/floral-crochet-and-swarovski-pearl?ref=sr_list_11&ga_includes%5B0%5D=tags&ga_search_query=crochet+veil&ga_search_type=all&ga_facet= and then add some tulle for the veil. There is a beautiful wedding dress in the May 2008 issue of Crochet! magazine ut it appears they used a ready made veil of tulle only. It is a good issue though and they even have a mother-of-the-bride outfit! I think the reason an entire crochet veil is not easily found is that one done all in crochet might be pretty heavy. A crochet lace edged veil would be gorgeous! If you want to crochet a whole veil, you'd certainly want a light weight, very fine thread. Of course, if for any reason you want huge cones to crochet with, there's a site, rmyarns.com that sells huge cones of fibres, mostly white or natural, in different weights. however, as they aim their business towards weaving, the weights almost never include typical crochet/knit size info (such as "size 10") and right now, I forget which one is closest to size 10, sorry. I ordered a 5 lb cone in natural once, about size 10...that thing is huge! good service and delivery speed though. I love the look of a spanish style veil!! I never had a formal wedding and DIE every time I see them, so beautiful!! 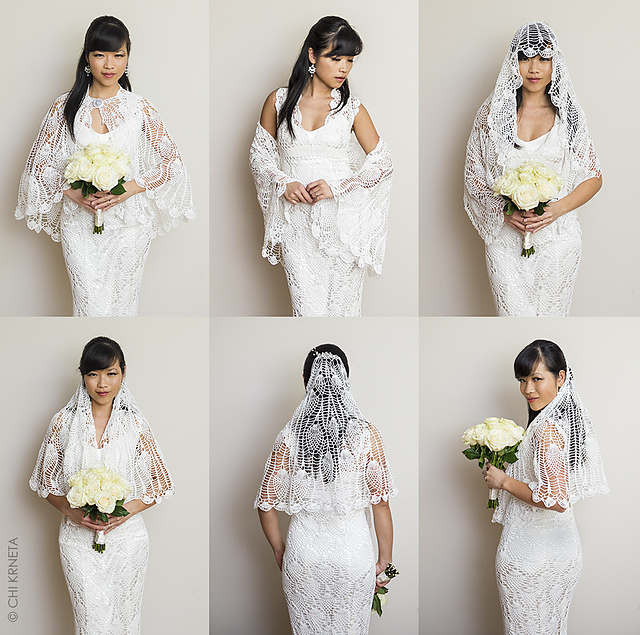 Google "spanish veil" and you will see some ideas on how to conceptualize a crochet version. This reminded me of a pattern I saw on Ravelry a while back although I think is not done with thread. That's a versatile pattern! I suspect it is probably made from thread, I've seen thread tops that look similar (thread thickness wise).